We were planning for a tour, some of the family members were interested to visit southern part of India and some were interested in north-east. Finally we decided to visit north-east. Everybody started planning, so did I. Before going to north-east I Googled about the different places, culture, whether and eatables etc. of north-east. While we were travelling by train to Nagaland we saw lot of pineapple fields, it was really interesting, I had never seen this fruit growing. During the visit I thought of getting some awareness and some more facts of this fruit. We started researching, first step we took was to taste fresh pineapple juice, it was YUMMY!! !, then we had some dishes of pineapple that day, Lemon-pineapple delight was served with the main course and Strawberry-Pineapple Parfait in deserts, these were awesome. Later during the travel, observing our interest in pineapple, my father arranged a visit to Central Institute of Horticulture in Medziphema, Nagaland. Spreaded in 43.5 ha with huge pineapple farms, photo gallery was tremendous. We were given lot of literature related to pineapple and some good recopies also. 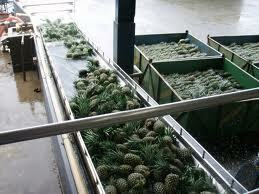 There are lot of initiatives taken by the government for pineapple growers and industry in processing etc.